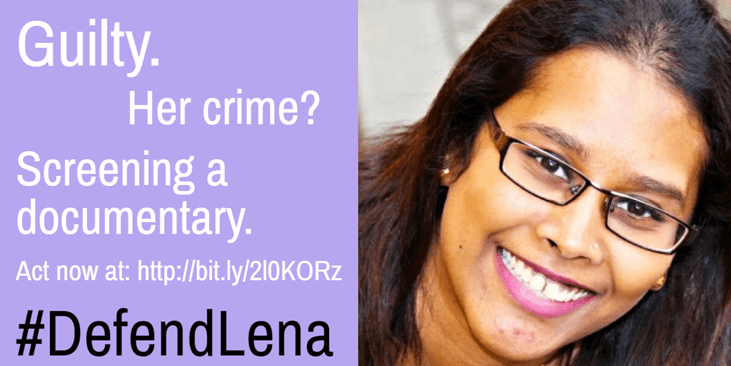 The AlterMidya Network expresses deep concern over the unjust conviction of Malaysian human rights defender Lena Hendry, who faces possible imprisonment for screening a documentary about alleged war crimes in Sri Lanka. The incident is a setback to the exercise of freedom of expression in Southeast Asia, whose citizens have for decades defended their right to freely voice opinion without fear of censorship or punishment. A program coordinator of human rights group Pusat Komas, Lena was sentenced by the Magistrate’s Court in Kuala Lumpur for screening the film ‘No Fire Zone: The Killing Fields of Sri Lanka’ without prior approval from the Malaysian censorship board. The documentary, made by UK-based director Callum Macrae, was about reported human rights violations during the civil war in Sri Lanka. Pusat Komas helped organize an exclusive screening of the film among a small group of invited guests during the 2013 Freedom Film Festival. During the film showing, Lena was arrested and charged in alleged violation of the Film Censorship Act for screening a film without permit. After a long process of court litigation, Lena was initially acquitted by the Magistrates’ Court in March 2016. But the public prosecutor appealed the case, which resulted in the high court’s reversal of the acquittal order. She is set to be sentenced on March 22 and faces a possible jail sentence of up to three years of imprisonment and/or a fine not exceeding RM 30,000 (US$6,700). Oddly, the police also arrested Pusat Komas officials present during the film festival but filed charges only against Lena. This only highlights the absurdity of Lena’s case and underscores her arbitrary and unjust persecution. We also find it peculiar that after the incident, the same film has been screened several times in Malaysia without any prohibition or harassment from authorities. Pusat Komas cited the film screening at the 2015 International Anti-Corruption Conference (IACC) in Kuala Lumpur, where the same documentary was shown without restriction. Since 2013, the Freedom Film Festival in Malaysia has successfully hosted films about human rights. It features films on racism, migration, freedom of religion and other socially relevant themes. The Festival has also accommodated films from the Philippines that depict the grim human rights situation under past administrations. The Festival has become a successful venue for human rights education, sharing, solidarity, and promotion of human rights among activists, filmmakers, and artists in Southeast Asia. AlterMidya is concerned over the possible implications of the incident on such progressive endeavors. We appeal to Malaysian authorities to review the case of Lena Hendry. Her persecution is a gross violation of her right to freedom of speech, freedom of assembly and freedom of association, which are all guaranteed under the Malaysian Constitution. It is ironic that a human rights defender like Lena is now being punished for helping raise awareness on human rights atrocities in other countries. We call on artists and filmmakers from around the world to stand in solidarity with Lena Hendry and uphold freedom of expression. Let us amplify the call to stop the unjust persecution of human rights defenders.